Communication and listening skills are fundamental in all areas of interaction. The way we communicate with others affects how they respond and feel about what we have said (or not said!). Effective communication is not all about conveying your messages to other people clearly and unambiguously. It's also about receiving information that others are sending to you, with as little distortion as possible. Being able to communicate well can benefit you in areas such as - being able to express our thoughts and feelings, learning about ourselves and other people, sharing information more effectively, the ability to resolve conflicts and the skills for building good relationships at home and at work! Today, effective communication skills have become a predominant factor even while recruiting employees. While interviewing candidates, most interviewers judge them on the basis of the way they communicate. They believe that skills can be improvised on the job; but ability to communicate well is important, as every employee becomes the representing face of the company. 1. Establishing Rapport: The ability to create rapport is the ability to create a harmonious relationship based on mutual trust or emotional ties. It not only makes the person feel comfortable but shows that you are interested in what they have to say gives your conversation a foundation as well. 2. Active Listening: The key to good communication is active listening. It helps us understand exactly what the other person is saying, where he/she is coming from and will encourage them to share more information. At times you might be tempted to interrupt but be patient and wait for the other person to finish talking. Besides, if they feel heard they are more likely to listen in return. 3. Body Language: Positive non-verbal messages are essential while communicating. Most of us don't realize what signs our body language shows. Make an effort to maintain eye contact while conversing. Try to avoid crossing your arms and legs as this gives out a closed or uninterested message. Acknowledge the other person while he/she is speaking by simply nodding. It's always nice to be reassured that someone is listening to us while we talk. 4. Clarify: If you fail to understand what was just said or did not catch a bit of the conversation, do not hesitate to clarify what you have missed. You can do this discreetly by asking the person a few questions or just ask him/her to repeat the sentence. 5. Explain Yourself Clearly: Before speaking, you might want to spend a few seconds running through what you want to say. While speaking, keep it simple and use words and phrases you are familiar with so that you can express your ideas or sentences clearly. Stop to check if the other person is following you. 6. Self-awareness: Make sure that your words, body gestures, facial expression, message and tone all match with one another. None of these should be different. For example, if you say you are concerned, show that in your body gestures and facial expressions along with a soft tone. 7. Be Confident: Streams of sentences spoken in monotone and punctuated with a flurry of "ums" and "uhs" is no more interesting than listening to a math lecture. Confidence in what you're saying brings validity to your words and ensures the listener that you mean what you say. 8. Practice, Practice, Practice!!! 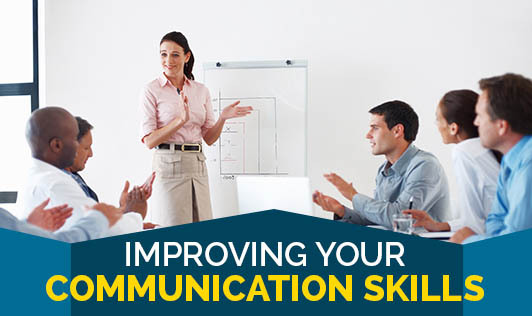 : The best way to learn to be a better communicator is to practice! Be it in front of a mirror or with colleagues, practice is what instills the confidence in you to be an effective communicator and listener!